We have become quite known for our stepping stones. It is fun to watch people walk by and spend time gazing upon our outdoor art display in our rock garden. People who do not bring their children here have been known to describe us as "that daycare on such and such street, you know the one with the totem pole and stepping stones." 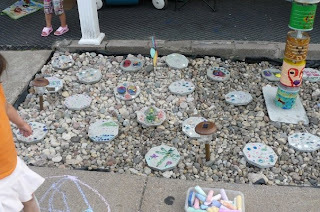 We are quite proud of our stepping stones, and the children look forward to making them every year. This year, we are a little bit behind schedule. (They are usually done by the end of May). We keep the stones over the summer to display in our rock garden and then in the fall before the snow comes, we send them home. Last year, the snow came before all of the stones were retrieved. Thus, we have a couple of stones left over. (Could be part of the reason I was not so concerned with getting our new stones made this year??? Perhaps.) At any rate, I don't think I will wait this long to get them done again. With the heat, making stepping stones is much more work, as we have to spray them much more frequently to slow the curing process. Here are a few snapshots of our stones today. We will be doing this for quite a few days as this is a project we like to make sure that EVERY enrolled child has an opportunity to participate in. A sampling of our treasures collected to decorate our stones with. (We have another tote full of options, but these are the ones that were choosen for today). 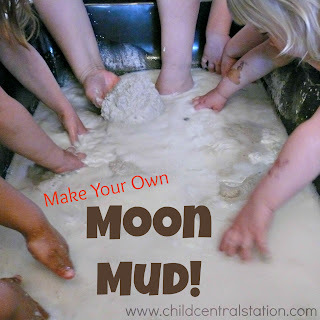 Even our youngest children (infants) are able to make a stone with some help. We put a handprint or a footprint in the stone. Then an older sibling, cousin, or friend helps to decorate around the child's print. As you can see, we don't use a "kit" to make our stones. For the "recipe" and how we choose our materials, you'll have to check back! This is a multi-day project, and I will get the directions up as we continue to work on them.